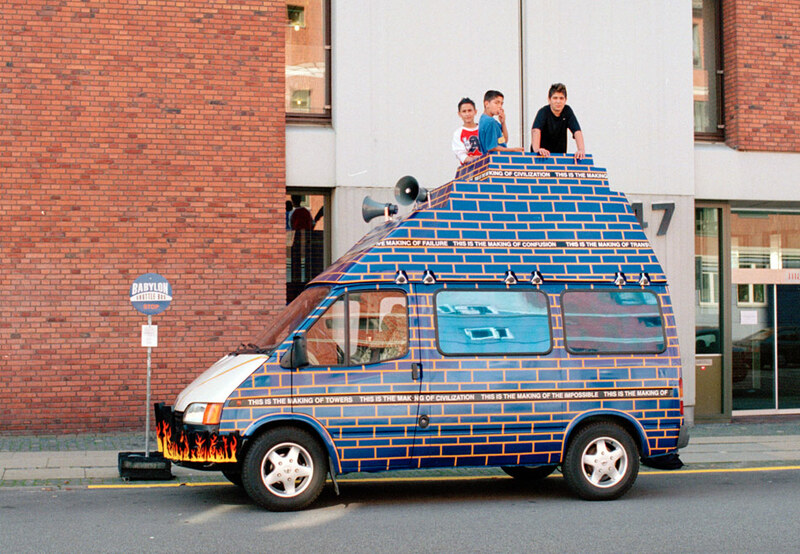 Babylon Shuttle Bus is a mobile sculpture and a stage. It was initially created as an intervention into the neighbourhood of Mimersgade in Nørrebro, Copenhagen, where it offered free local transportation for the public for one month. 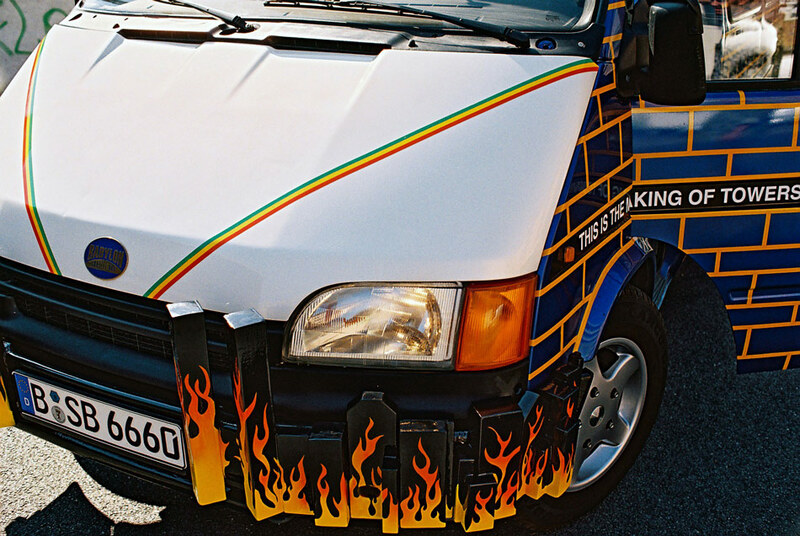 Fulfilling its Babylonian theme, Babylon Shuttle Bus became a place of language confusion and communication as the vehicle acted as a social meeting point and topic of discussion for the local community in one of Copenhagen’s most multi-ethnic areas. 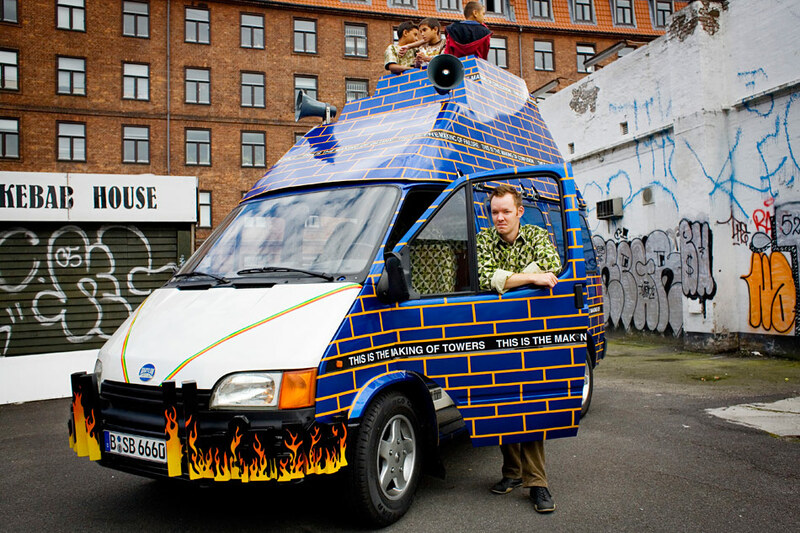 The bus itself is a loud audio-visual moving sculpture that works as a Babylonian collage – each sonic and visual element, from the pattern of the seat’s cover to the bumper and the sampled songs in the soundtrack played from the speakers on the roof, are made with direct reference to Babylon as a kaleidoscopic, culturally loaded metaphor. Babylon Shuttle Bus also became the stage for Talks on Babylon, a series of performances with invited expert speakers and video archive. 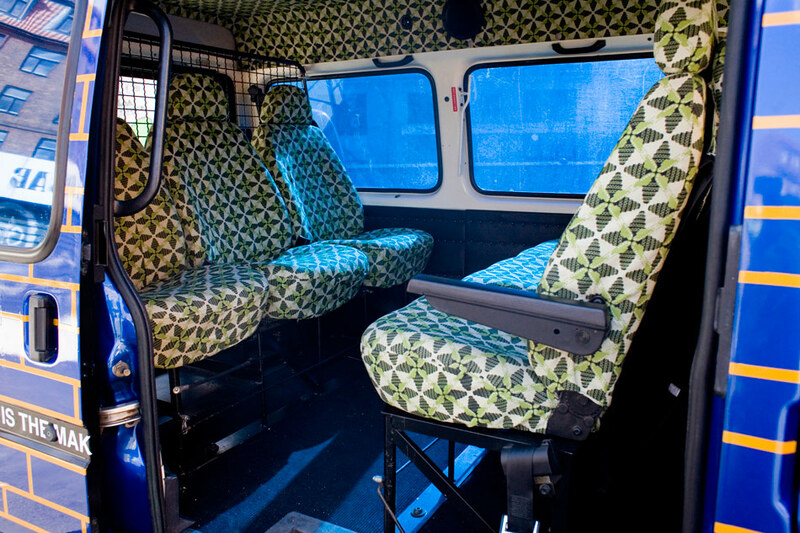 Babylon Shuttle Bus was developed for the public space exhibition Sit Down! 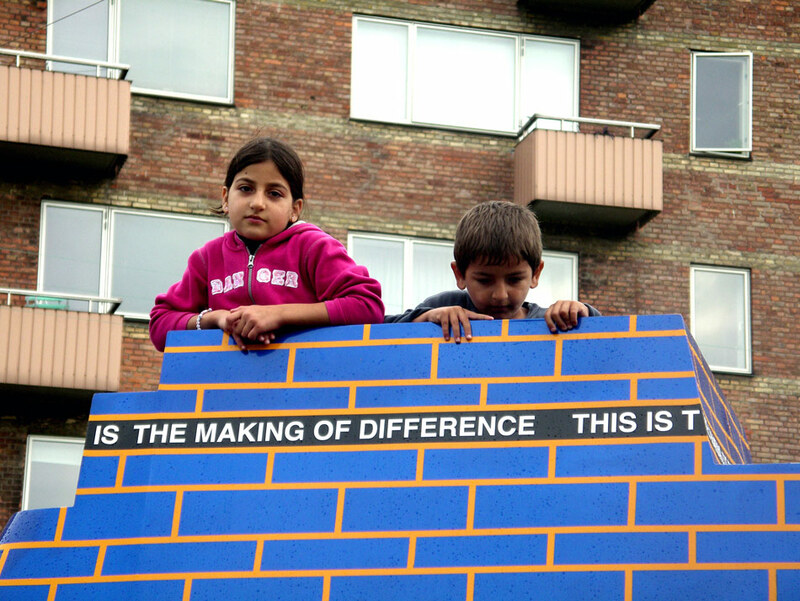 – Contemporary Art in Mimersgade in 2006, curated by Christian Skovbjerg Jensen. Talks on Babylon took place at Den Frie Udstillingsbygning, Copenhagen, and at Uqbar, Berlin, as part of J&K’s solo show Talking Babylon (both 2007). 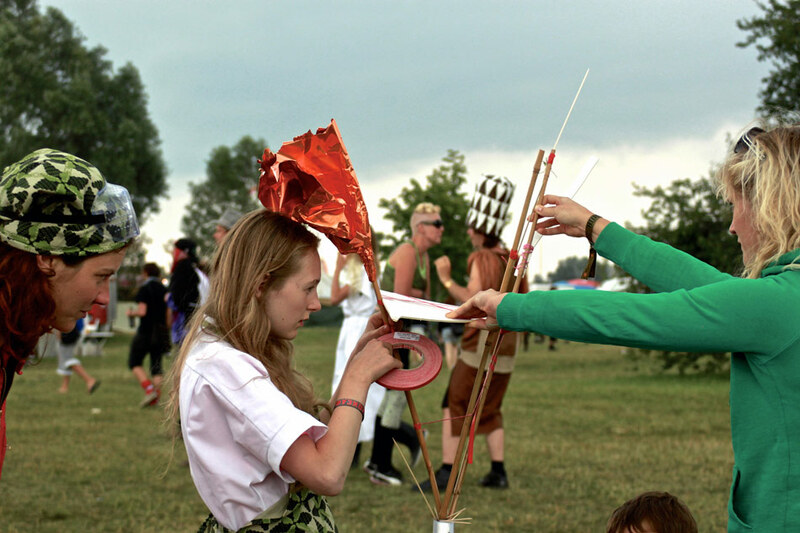 In 2013 J&K donated the sculpture to Fusion Festival where they performed Mobile Utopia Research Unit. Sound design by Alex Fahl. 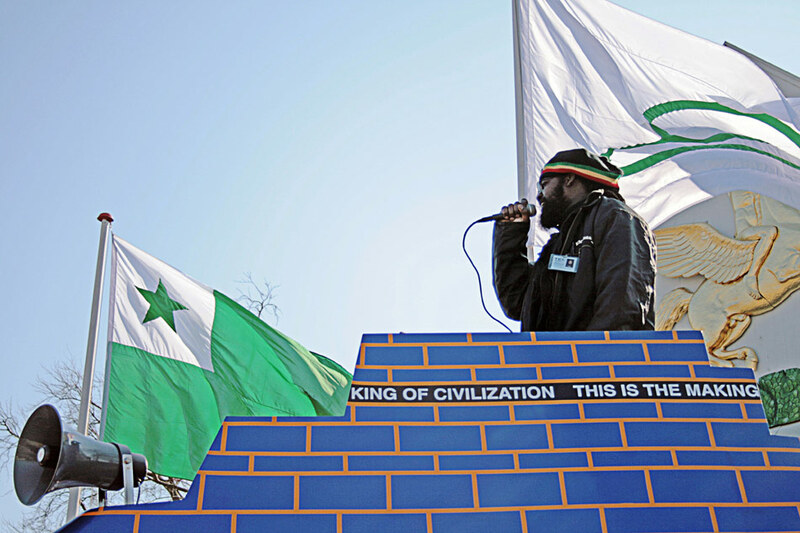 Expert Speakers Talks on Babylon: Blakk Gold (rasta poet), Per Ramsdal (priest), Boris Buden (culture philosopher), Alexandra Müller-Benz (tarot reader). 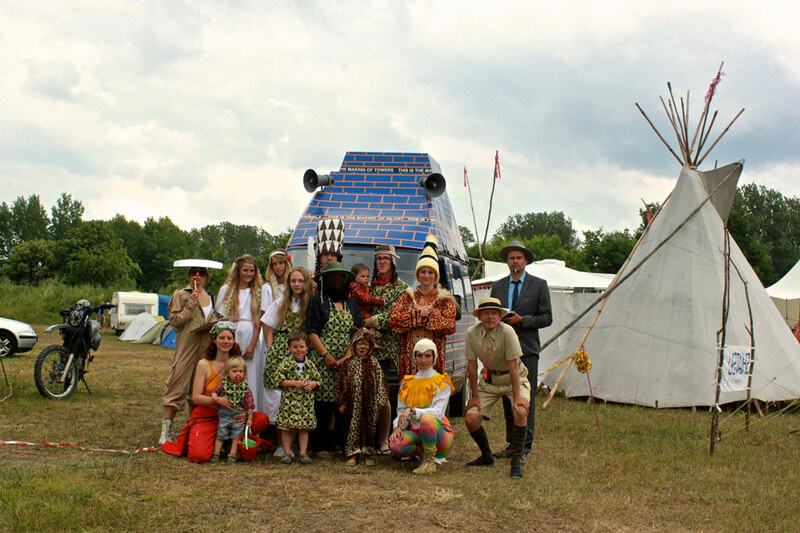 In 2013 Babylon Shuttle Bus was handed over to Fusion Festival, Germany, as its final resting place. As a last act of the bus, it became a platform for a performative research project. 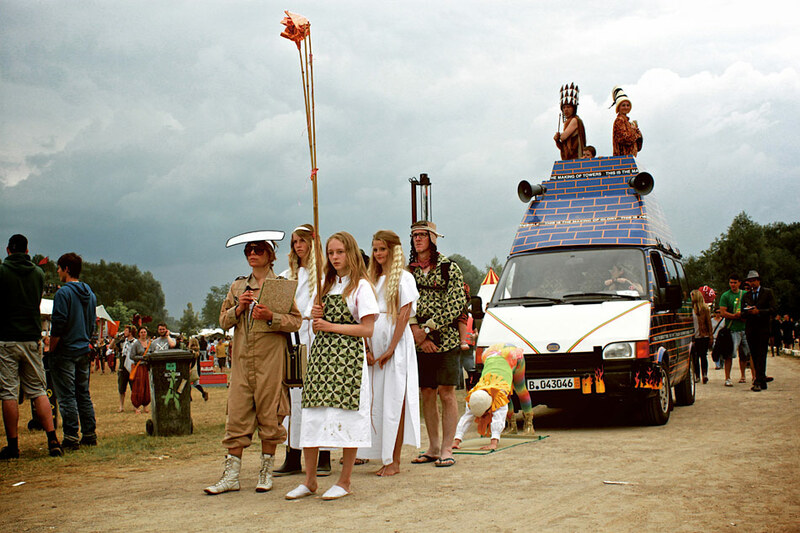 Babylon Shuttle Bus was declared to be a time machine that had transported its crew of colourful researchers straight from the building site of the fallen Babel Tower to Fusion Festival. In spite of the total collapse of the Tower of Babel the crew was still determined to continue their impossible quest for Utopia, believing they could realize an ideal society – a paradise on Earth. Seeking help and inspiration they involved the festival goers in their mission: impromptu manifestos and creative experiments fed into a communal process in which the utopian potential of the festival was scrutinized in the attempt to stimulate visions for an ideal future society. Performers: J&K, Nefer Jørgensen, Katrine Godsbøll Jørgensen, Linards Kulless, Mika Kokkonen, Mona Kokkonen, Gea Mey Williams, Hannah Birch Munck, Sif Birch Munch, Christoph Mühlau, Cosmo Roitmann, Philip Roitmann, Mette Schwarz, James Williams, Clemens Williams, Polly Williams.